So I found these darlings on a Swedish auction site called Tradera. 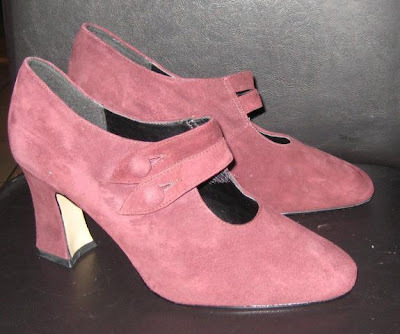 They are made of a dark burgundy suede, have quite a heel and the perfect construction for remodelling into a pair of 18-th century look a likes. I have'nt decided yet if I should redress them in black velvet or blue velvet. The black veriosn would make the a perfect "go with anything" shoes, but the blue would look stunning togheter with my outfit. Cute shoes! 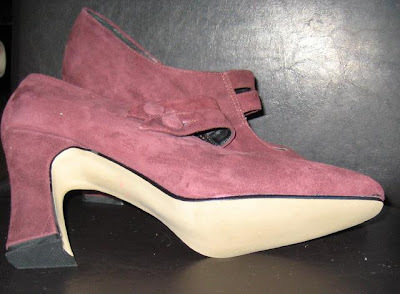 I can't even allow myself to think about modifying shoes because there is so much for me to do. But they are great and dare I say it....you wouldn't even need to modify them at all. Well, the problem with them right now is that they have completely wrong color. The photots are a bit off color wise, they are really a dark burgundy. They are such a fantastic colour! 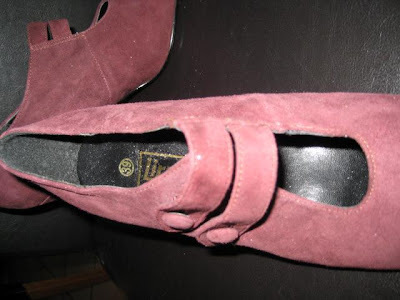 Don't modify them - you will find other shoes that are black and blue coloured. Pink and dark burgundy are too hard to find to mess with!